Honor Marine was founded in 1977 by Lyle LaRosh and Rick Beck, and for the past 30 years we have been earning our reputation by taking care of some of the toughest customers a company can have - professional fishermen. When your livelihood depends on reliable service and top-quality equipment, as a fisherman's does, you expect your electronics dealer to provide you with the best equipment available, and then to keep the equipment running at peak performance levels - no matter what the conditions. At Honor, we pride ourselves on our strong relationships with two stellar US fishing fleets, the Pacific-based tuna fleet, and the world's largest sport fishing fleet, based out of San Diego. In addition, our relationship with the US Navy, Coast Guard, Homeland Security, and the San Diego Harbor Police point to our ability to provide important customers with dependable, competent service and fairly priced and expertly installed electronics. Our strong ties to the commercial and military ships that keep our economy strong and our nation safe are recognized and welcomed by the captains, owners, and managers of the large yachts that roam the globe today, yachts with demanding schedules that can't afford to wait for service. Recognizing this, HONOR MARINE offers the large yacht fleet the same unsurpassed, worldwide service and expertise that we do our commercial and military clients. Our clients use their boats, and that means they spend little time in port. HONOR MARINE sends our technicians anywhere in the world to service our customers. They wouldn't expect, or accept, anything less! 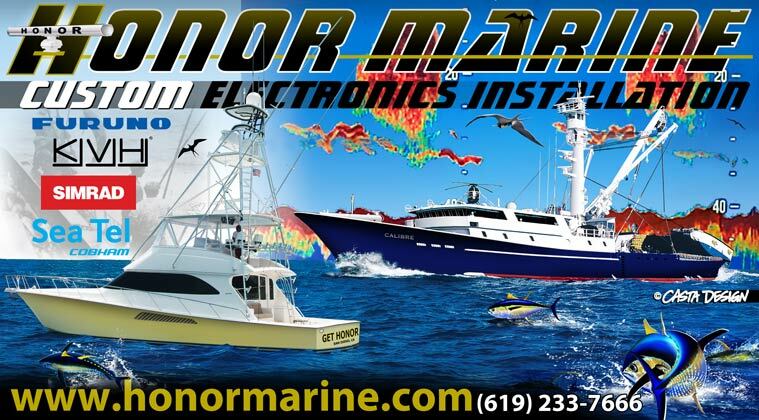 Our mission is to provide the finest marine electronics available to the commercial, military and yacht fleets of the world, and to install and service our products in a manner of competence and excellence unparalleled in our industry.